Alone since four members of the family died of arsenic poisoning, Merricat, Constance and Julian Blackwood spend their days in happy isolation until cousin Charles appears. How's that for a succinct review? The problem is, this summary doesn't really give you a feel for this book. How about the first paragraph instead? "My name is Mary Katherine Blackwood. I am eighteen years old, and I live with my sister Constance. I have often thought that with any luck at all I could have been for a werewolf, because the two middle fingers on both my hands are the same length but I have had to be content with what I Had. I dislike washing myself, and dogs, and noise. I like my sister Constance, and Richard Plantagenet, and Amanita phalloides, the death cup mushroom. Everyone else in my family is dead." 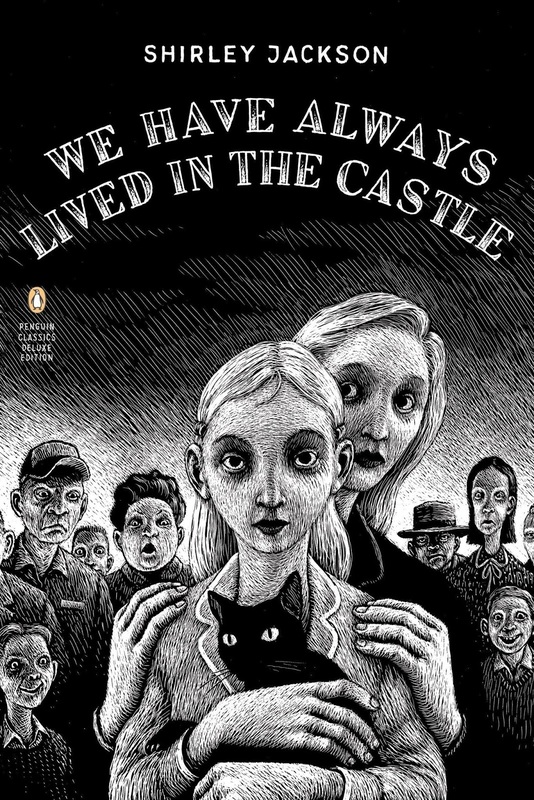 Guys, I have no idea why I haven't read We Have Always Lived In The Castle. And now I'm kind of sad that I can never read it again for the first time. It is an amazing blend of darkness and light. Jackson toys with her readers as Merricat, and her Uncle Julian, slowly reveal the Blackwood family history. The writing is incredibly vivid - the Blackwood home, the land around it, and the nearby village itself all become characters in the book. "All of the village was of a piece, a time, and a style; it was as though the people needed the ugliness of the village, and fed on it. The houses and the stores seem to have been set up in contemptuous haste to provide shelter for the drab and the unpleasant and the Rochester house and the Blackwood house and even the town hall and been brought here perhaps accidentally from some far lovely country where people lived with grace. Perhaps the fine houses had been captured - perhaps as punishment for the Rochesters and the Blackwood and their secret bad hearts? - and were held prisoner in the village; perhaps their slow rot was a sign of the ugliness of the villagers. The row of stores along Main Street was unchangingly grey...whatever planned to be colorful lost its heart quickly in the village." Merricat might be called precocious; she is certainly childlike in many ways. But there is a depth and a darkness to her the kept me wondering about her throughout. She is certainly one of the most interesting characters I've read in a long time and I think she's going to stay with me quite a while. She has an innate awareness of imminent peril, a belief in unnatural powers, a deep appreciation of the land around her, a profound love for her sister, and desperate need to maintain order and ritual. I don't often reread books (almost never, actually) but I'm seriously thinking that this book needs to be reread every year about this time. I can't read it again for the first time but I'll still be happy to pick it up and savor Jackson's story again. Labels: book review, Gothic, mystery/thriller, R.I.P. I'm thinking of doing a 'Shirley Jackson' month with the mystery group next year. This would be perfect for October wouldn't it? Happy dance! This is one of my all-time faves. I've read it and re-read it and listened to it, and just YES! I read this one last year. Jackson is a unique horror writer and am so glad I discovered her! I'm listening to Haunting of Hill House right now and am enjoying it immensely. Merricat is definitely a unique character. It's interesting that you are anticipating rereading it--I felt such a relief at finishing it, I'm not sure I could reread it. It's all about mood, I think. Shirley Jackson is definitely a powerful story teller with a dark side that rivals Stephen King's! I've not read this one but it does seem to be a classic book, meant to be reread again and again.